Don’t forget the shoes and a top! 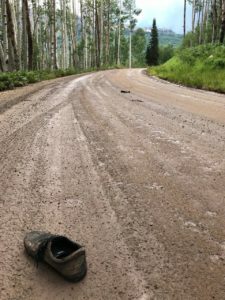 It’s a pretty common thing to get done a long hike, bike, or backcountry run and take off the wet shoes and socks only to leave them on the bumper or the roof of the vehicle… then drive off with your free flying flip flops on while the wet shoes and socks now become a part of the road furniture. 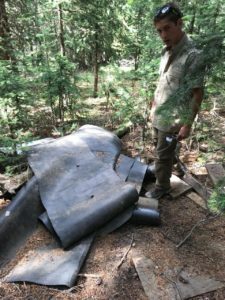 It’s not so common to find a pickup topper in the backcountry, left behind so someone else can clean up the mess. We do not like trash in the backcountry, but we love to go and get it when there is. 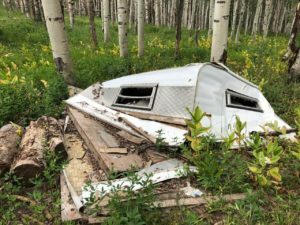 The CB Conservation Corps (CBCC) pulled a topper and the remnants of some soul-less vagabonds camp from Kebler Pass Road, near Long Lake just last week. Now we inherit what could be filled with asbestos and have to find the proper way to get rid of it. All in a days work making sure the soul of our back yard, our backcountry, is intact. It seems we are over the hump; granted Arts Fair is a pretty busy time in our hamlet. 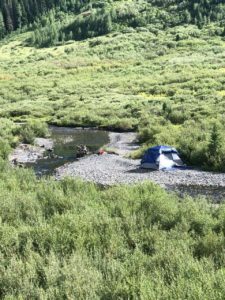 The backcountry camping and recreationists seem to be dwindling down at the end of the weekend, and one might even be able to find a favorite spot early in the week. Still, not a trailhead, parking area, or unimproved campground goes undetected by the CBCC crews, and we still pull anywhere from 5 to 25 pounds of human waste and TP from the hot spots whenever we get at them. In some cases, it’s not even hidden. At the West Maroon trailhead on 7/21, there were five fresh dookies right in the open for all to see, let alone one that was 20’ from running water. 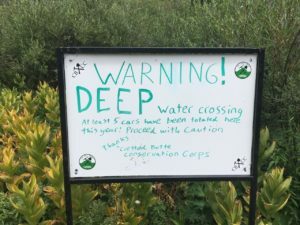 Along with plenty of folks out there playing by the rules and proving that signage and improved areas do reach people, it is July, and there is plenty of blatant disrespect for environmental and ecological impacts. 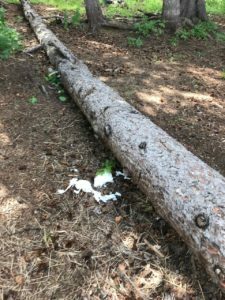 Along with the Topper and its associated trash, the CBCC pulled another grill, stove pipe, tables, tarps, and whatever else was left behind of a hunting camp not far from the start of the Dr. Park downhill. Hygiene products, micro trash, shoes, and socks are a part of the mix these days and we hope to see this stuff a lot less in August. After 12 weeks and noticeable positive impacts, the CBCC is being well supported by so many in our community, and we are so grateful. We are more so proud to have huge, huge support from our friends at the Gunnison-Crested Butte Tourism Association (TA), along with Gunnison County. Besides our wonderful Towns support, we’re honored to have the backing and support of the County and the TA who are walking the walk when it comes to providing positive experiences and looking to maintain and sustain our most precious of resources – our backyard! We’ve still been concentrating on the heaviest hit areas, and Dr. Park, lower 401, 403, Tony’s, Baxter’s, 400, and more have seen regular maintenance and upkeep. 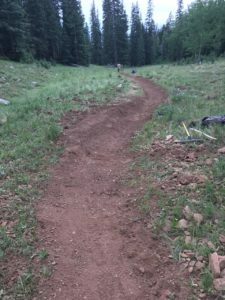 The Forest Service is doing yeoman’s work on Carbon Creek Trail #436, and the loop with Baxter/Carbon/Green Lake is a wild new amenity. 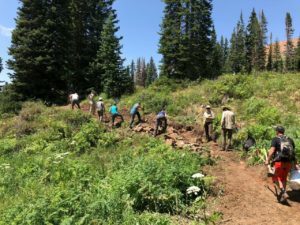 The Western Colorado Conservation Corps is also here on behalf of the Town of CB and the CB Land Trust, and currently doing great work on the beginning of Baxter Gulch. 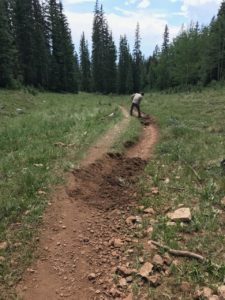 Join us, the Town of CB, and more on Thursday, August 2nd, for a BBQ at noon to celebrate the true opening of the Baxter Gulch trail, right there at the trailhead. All are welcome!